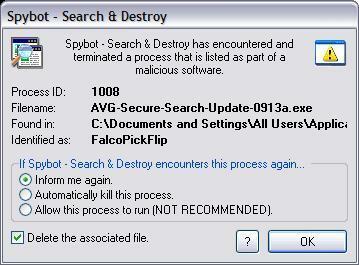 Spybot S & D Found Malware in AVG? 9/9/2013 9:27:36 PM Encountered and terminated FalcoPickFlip in C:\Documents and Settings\All Users\Application Data\AVG 0913a Campaign\AVG-Secure-Search-Update-0913a.exe! Does AVG have malware? Anyone else have a similar situation? What did you do to remove it? Screenshot of pop up message is also attached. Hello Tom, welcome to GeeksToGo! Whilst this appears to be a false positive, this can only be confirmed by Spybot and hopefully they will release information about it soon.